Riverbend is a terrific lake front home on magnificent Lake Martin. Conveniently located just south of the Highway 280 bridge Riverbend offers instant relaxation with easy access. Riverbend is built around a fabulous great room which overlooks the lake and also includes: a woodburning stone fireplace, vaulted ceiling, expansive windows, a 40' LCD TV for the big game, and a bar between the kitchen making it perfect for entertaining. There are 3 master suites (all having their own private bathrooms) and one 'bunk room' for a total of 4 bedrooms. The 'bunk room' is a converted carport and has four twin beds. This room is designed for kids and may not be suitable for adults in your party. There is no closet in this bedroom and no chest of drawers. A gently sloping lawn brings you to the lakefront that features a stone seawall, large pier, later for easy water access, and plenty of room for several boats. -New bedroom furniture and mattresses. - New floating dock with stairs going into the water for easy access even in off season when the lake is down. Call us now and see why so many of our guests book year after year. Many families come back to Riverbend year after year because it is truely a great lake home. Ease access from Birmingham, Atlanta, Montgomery and Auburn/Opelika make this home easy to get to and easy to find. Riverbend is located in a quite residential neighborhood just 3 minutes from Highway 280 making it super easy to find. Guests will enjoy a terrific and very large pier and dock. The pier features ample room to tie up to 3 boats and also offers steps into the water for easy access. A gently sloping yard makes it easy for everyone to get to the waters edge. An expansive living, dining and kitchen area make it easy for everyone to relax together. 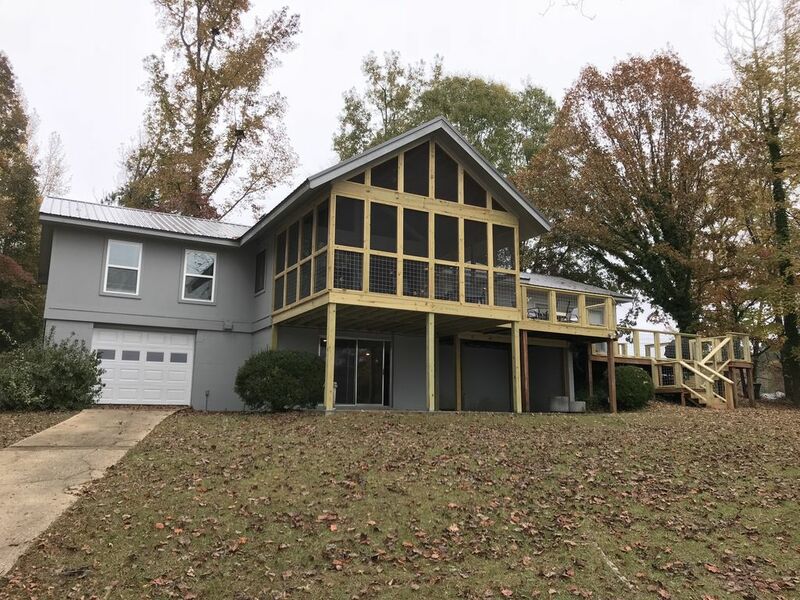 This area features: large cathedral ceilings, wood burning fireplace, 40' LCD TV, and huge picture windows to take in the peaceful Lake Martin views. Downstairs is a game room with a pool/ping-pong table to keep the fun going and give the kids a place to get away. Guests routinly enjoy fishing from the doc and banks. There are also great fishing spots nearby by boat if that is where your heart lies. Easy access to Alexander City (about 15 minutes) and Auburn/Opelika (about 35 to 45 minutes) make this more than just a lake getaway. Shopping and other activities are close at hand. Riverbend also makes a perfect Auburn home game base camp. We are sure that you will love your stay with us at Riverbend. We had a very enjoyable experience. The home was clean and organized. Unfortunately due to the weather we left early but would definitely rent this home again. While we loved the deck and location on Beautiful Lake Martin, the state of disrepair and just general filth of the home cannot be overlooked. The kitchen is an absolute fright. The carpets are downright disgusting and the neighbor who cleans the house clearly needs a vision checkup - dirty fingerprints -everywhere. We encountered two cockroaches while we were there - which I am sure are common in the deep South. I'll return to Lake Martin, but not to a Harris Property. Holly, we are sorry that you feel that you had a poor experience. We will address your complaints with the cleaner. We have had over 40 reviews with positive responses about the cleanliness of the home and this is the only complaint we have gotten in regards to the cleanliness of this property. We hope that you will give us another chance to make this right. My girlfriends and I enjoyed our stay very much! There was plenty of room everywhere. A patio, huge pier & floating dock, pool table, big living room and dining room table to accommodate 8 people. The kitchen had a pantry and plenty of cabinets with storage and counter space. We will certainly go back again! Hi Marie, thank you for the great review. We are so glad that you and your group enjoyed your stay at Riverbend and that you found the home to be accommodating for you and your group of 8! Thank you for Letting Harris Properties host you. We hope to host you again soon! Had an awesome time celebrating my sisters 60th birthday. The House was great. Am concerned about the deck and railing safety. Nails were protruding and the railing wobbled! The view and weather was great the cleaning lady came and checked on us and was very helpful and kind. This was the second time some of us had stayed here and would love to come again! Hi Sue, thank you for the review. We will send someone out to inspect the deck and railing. We hope that you were still able to enjoy your stay despite this issue. We hope to host you again soon! We enjoyed our stay in the home fishing was great as well as swimming the wheather was not so nice the first knocked out internet while we were there so we didn't have it , But we still had a fantastic time wish there was a hand rail going into room with 4 beds and steps on other side of deck to go to pool room which was very nice, The Lady across from us was veru helpful in lettings us know where places were around us she was super sweet, The home was very clean and fresh when we got there the lawn men came they were very nice as well We were very happy with our choice of homes in the area to be at and would love to come back again, Anyone want a peaceful vacation spot could not go wrong with this home oh and the wild life is fantastic to watch We really didn't want to leave and the kids were very sad the day we had to go they said it was their best vacation yet and for a 14 year old girl that says alot my grand daughter was ready to move in for good ! Thanks for having us!! Hi Donovan! Thank you for the great review! We are so glad that you and your family had such a great vacation at Riverbend and that we even passed the test of your teenager! Thank you for letting Harris Properties host you. We hope to host you again soon! protruding nails. Suggest a bench for the dock for seating. Hello Susan, thank you for the review. We do apologize that you experienced issues with pests during your stay. We will call the pest control company and have them spray the home. We will also have the deck checked for the nails. We do apologize that you experienced these issues during your stay. We hope that you will give us another chance to host you with a 5 star stay.